Kynzie graduated from Western Oregon University in 2008 earning her Bachelor’s Degree – majoring in Humanities with a double minor in social science and legal studies. During her time there, she worked for both the WOU Writing Center and The Journal, the campus newspaper. After graduation, she attended at Willamette University College of Law where she worked as a Legal Research and Writing Student Assistant and was a Court Certified Law Clerk for the Marion County District Attorney’s Office, specializing in Domestic Violence crimes. 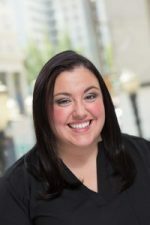 Kynzie graduated with her Juris Doctorate and Certificate in Dispute Resolution in 2011 and was admitted to the Oregon State Bar. That same year, Kynzie began her role as in-house counsel for NAVEX Global (formerly EthicsPoint) and grew into a leadership role within their human resources team where she consulted on employment law issues and managed the global recruiting team. Today, Kynzie is the legal content product manager for Compli, a compliance software provider, but she still loves to teach Legal Reasoning and Writing for her alma mater. Fall 2018 – Kynzie Sims is not teaching fall term.